Fear the ultimate dragon obsessed freak! MUHAHAHA! 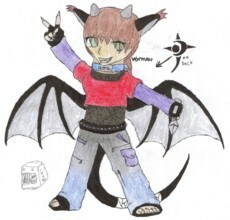 My interests are drawing, reading, writing, dragons, and ROLE PLAYING! YAY! When Chip and his friend are sucked into the Digital world, there's no telling wat will happen. For Flax, being a sprite was never easy, but life gets harder when he has to escape. Will he and his new friends ever make it to the Nexus, or will the dreaded Jirachick catch them? Come, friends, and listen to what I have to say about the old elf, now lich, dyran. Certainly. Let me check my arsenal...Ah yes. My little Xirros parasite. http://wyrmses.deviantart.com/art/Parasite-81717618 It only ever gets about as long as a pencil. They will devour you from the inside out, starting with the least important organs. You know what they say. Save the best for last. And the best is the brain. ^^ >3> I might actually have a preferance for this one. Maybe if you could draw more than one around a skull or something. If not, then that's fine. Do whatever you like. >3 I just have a sick mind. Oh, I was wondering what happened to you! I was worried! But not yet. I got that movie for my boyfriend for Christmas, though, so we'll see it soon. Well, at least you're feeling better now. I know, I was lost for a week. Boyfriend problems. http://wyrmses.deviantart.com/art/Please-Tell-Me-92416372 There. Sorry about that. ^^ Yupyup. Sorry I got so sidetracked. XD I fail. XD Well, thanks, I guess. Fatal's talking about me? Why on earth would she do that? Aw.... Go ahead. I prolly wont get it up for a while, though. I can draw..... Dragons. And monsters. XDDDD Okay, okay. Well, my Kestas is the Celestial Dragon..... Now then.... From you... >> Er... What can you draw? Hmmmmn.... Well, do you wanna draw Xrokt? Well, how about this: Any time I request from her, that automatically requests you, too? ^^ You get the same as her. Hey, no prob. If you could even move the blade a little further away from the handle, that would be nice. >> My boyfriend says it looks like an axe. XD He's supposed to be undead. He THINKS he's the Grim Reaper. Hey, I keep telling you it's fine! XD No need to rush.